The post-Ford era Panteras (GTS, Group 3, and GT5) were equipped with 351C engines manufactured in Australia. So I figure a few of you North American owners of these cars may have a pair of Australian made small port OPEN CHAMBER iron heads stacked in the garage. If so I'd be interested in buying a pair of them from one of you. 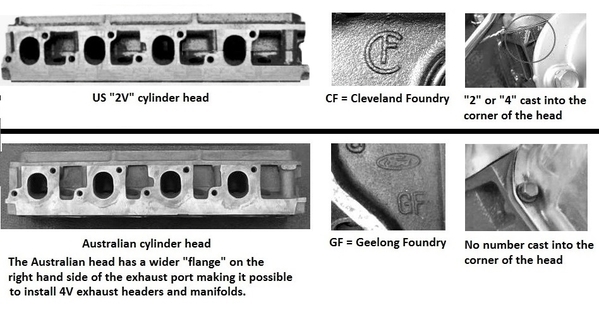 Australian Ford also produced a quench chamber version of the small port head, it was original equipment on the 302 cubic inch version of the Cleveland (i.e. the 302C). That head is the popular head, the head most people want. But its not the head I'm hoping to find. I could use the 302C head, but I'd prefer the open chamber version that was original equipment on the Australian made 351C. The Australian open chamber heads differ from US open chamber 2V heads in one important way, they have a wider flange around the exhaust port, allowing 4V exhaust headers to seal up around the smaller 2V sized exhaust port. Your Panteras would not have been able to use GTS exhausts unless the heads had this capability. The picture below illustrates 3 ways to identify an Australian head. Surely someone has a set of Australian 351C heads removed from their post-Ford era Pantera. I have two, and an Aus four barrel intake manifold too. The heads are not a true pair, and one of the them has some rust pitting of concern. http://www.ausfordparts.com/ might have what you need. Seems like most are looking for closed chamber heads though. Thanks for mentioning Aus Ford Parts Rick. I've actually been in contact with Lawrence (the Aus Ford Parts guy). If a Pantera owner wants to lower the powerband of his Pantera's engine, the Australian heads are the small port heads to use because of the extra flange width around the exhaust port. There are two choices in Australian heads, 302C heads with quench chambers or 351C heads with open chambers. There's a 14cc difference in combustion chamber volumes between the two heads. You can achieve the same results with either head, the paths are slightly different. The 351C heads have open chambers which flow better "off the shelf" (they're worth 10 bhp or more), but require pop-up dome pistons to make equal compression. The 302C heads need some grinder work in the combustion chambers to unshroud the valves (and flow as well as the open chamber heads), but can achieve good compression with a flat top piston even after opening-up the combustion chamber. A picture is worth a 1000 words. For those whom I've confused, or just curious. There were two Cleveland heads cast in Australia. 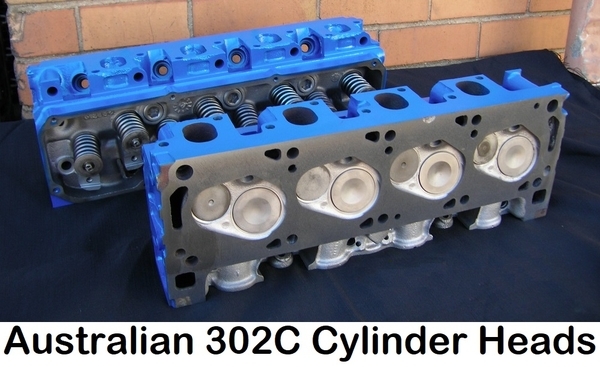 The heads below are the popular ones, from the Australian 302C. They are what an American would call a 2V head, i.e. small ports and small valves. They are however the only 2V head to have a small "quench" style combustion chamber. But of importance to me, notice the extra width of the flange to the right of the exhaust port. This allows 4V headers to be used with these "2V" sized heads. Headers such as the Euro GTS, Group 3, GT5, and early GT5-S exhaust systems. 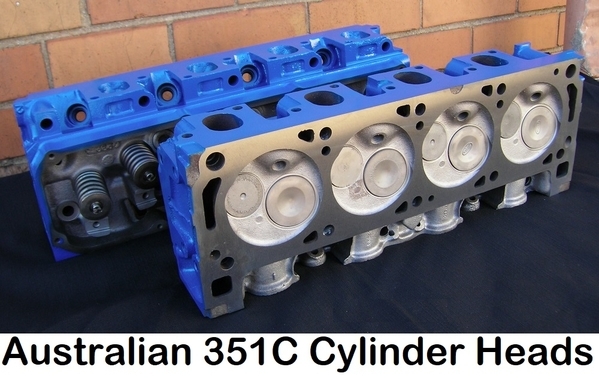 This second set of heads pictured below are from the Australian 351C. Like the previous heads they are what an American would call a 2V head, i.e. small ports and small valves. These have 14cc larger "open" style combustion chambers. But, like the 302C heads, they have the same extra width flange to the right of the exhaust port. These are the heads I'm hoping to find.